Ulaanbaatar. Mongolia city. Place to visited in region of Mongolia. Sights of intersest. (ULAN-BATOR, ULANBATOR, ULANBATAR, ULAANBATOR, ULAANBATOR). Ulaanbaatar was founded in 1639. With over one-third of the country's population, Ulaanbaatar is by far Mongolia's largest city. It is also the transport and industrial center of the country. Often shortened to UB by foreigners (but not by locals), Mongolia's capital still has the look and feel of a neglected European city from the 1950s - but not for long. The old Soviet cars and buses are being replaced by newer Japanese models, apartments are being converted into flashy shops and it seems that every young Mongolian now has a mobile phone. Ulaanbaatar prides itself on being an increasingly modern (though still very laid-back) city. Despite all this, men and women still stroll along the main streets in traditional dress. Built along the river, the Tuul Gol, and surrounded by picturesque mountains, the center of Ulaanbaatar is dominated by Soviet-style high-rise apartment blocks. Yet about 250,000 locals live in sprawling suburbs on the outskirts of the city, opting to live in traditional ger (circular felt yurts). The topography makes for good hillside views overlooking the city, however, during winter the view is frequently obscured by pollution. This environmental problem is further exacerbated by temperature inversions caused by the coal burning that powers the Soviet-built heating system. Despite being the national capital and largest city, Ulaanbaatar retains a relaxed, small-town atmosphere. It is a very pleasant place to visit and to base yourself for trips around the country. 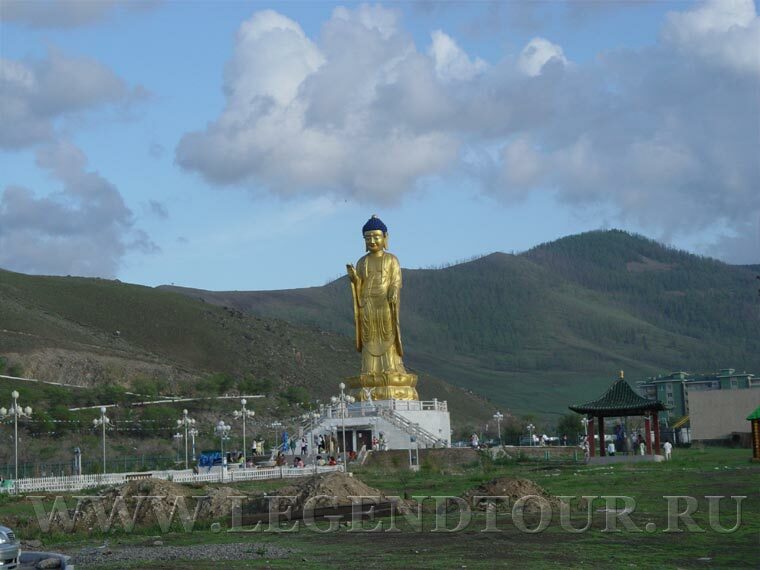 The city has interesting monasteries and museums and excellent cultural shows, so try to spend some time here before heading out to the glorious valleys, steppes or desert of Mongolia. The Traditional religion of the Bogd Khan Mount Khangarid is official emblem of the city that dwelled on the bumper shaped back. The Khangarid emblem implied about for the city will be develop, popularity in the world. Symbol on the Forehead of the Khangarid implied referenced for polity and knowledge, right hand has the (ocher) key that implied open the blessedness door for citizens, left hand has the lotus that implied affirmation of the peace and tramped on snake that implied annihilated for enemy of human from the world. The city’s flag colored the blue of the sky. The symbol of the city depictured by white silk and bordered by golden thread on the blue flag. It means city residents respect their polity and bloom their life. The flag’s weight, long is 1:1,5. Ulaanbaatar is situated between four mountains: Bogda Khan Uul, Chingeltei Uul, Bayanzurkh Uul and Songino Khairkhan of the Khentii mountain chain, stretching from the Altan Tevsh valley of the Tuul basin, at an altitude of 4,921 feet (1,500m) above sea level latitude 47° 57' north and longitude 106° 55'. According to the Constitution of Mongolia "Ulaanbaatar is the capital city of Mongolia", and the country's main political, economic, industrial, scientific and cultural center. Most of the city spreads from East to West along the main road, Enkh Taivny Orgon Choloo, also known as Peace Avenue. The center is Sukhbaatar Square, often simply known as 'the Square'. Sprawling suburbia is limited by the four majestic mountains that surround the city. The river to the South, the Tuul Gol, also somewhat limits the growth of suburban expansion. Useful landmarks include the Trade & Development Bank building to the North-West of the Square, the twin towers of the Bayangol Hotel to it's South, and on top of the hill immediately to the South, the Zaisan Memorial. Around the Square are the Central Post Office and the Palace of Culture, and two blocks West of the Square is the State Department Store. Central Ulaanbaatar is defined by two ring roads; Baga Toiruu (Eittie Toiruu) and Ikh Toiruu (Big Toiruu). In 1926, there were 27,021 people living in Ulaanbaatar, whereas today, it's population is 668.8 thousand (1998), which accounts for 27.7 percent of the total population of Mongolia. Ulaanbaatar produced 75 percent of the total electricity in 1998 and 41.5 percent of the total domestic products of the state originated in Ulaanbaatar. The population of Ulaanbaatar enjoy better living conditions if compared with other parts of Mongolia. In 1970, there were 59 secondary schools with 54,000 pupils. Today the number stands at 115 schools with 139,948 pupils. The number of physicians and hospital beds per person is higher than across the rest of Mongolia. According to the statistics of 1970, there were 41 physicians per 10,000 persons, and the number stood at 212 in 1998. There are many theatres (opera, drama, puppet and children's), museums (historic, natural and art galleries) and historic monuments and sites in Ulaanbaatar. State organizations of all levels, foreign embassies and international agencies are located there. With the establishment of new socio-economic relations, the role of the capital city in the development of Mongolia has dramatically increased. Considerable developments took place in the foreign relations of the city. Now Ulaanbaatar has friendly relations with foreign cities such as St. Petersburg in Russia, Denver and Colorado, USA, Tokyo, Osaka and Sapporo in Japan, Munich in Germany, Florence in Italy, Tiangjin in China, Ankara in Turkey and Seoul in Korea. The Capital city today produces 40 percent of the Gross Domestic Product, which can be broken down as 53,4 percent of industrial production, 87,1 percent of construction, 56,3 percent of trade, 80 percent of energy and 98 percent of transport and communication. 165.000 children study at its 98 state-run secondary schools and 8500 in its 67 private schools. 31.000 youngsters attend 154 kindergartens, which is 32 per cent of all children in the country to attend kindergartens and pre-school establishments. There are 73 clinics with state, city and district status and 112 family hospitals. There are over 250 hairdressing salons; about 100 cosmetics retailers. 60 tailors' shops; more than 130 cobblers; over 30 launderettes and dry cleaners; 700 car repair workshops, and about 800 pawn shops. More than 3800 private businesses operate in the capital city. There are 214 streets; 3100 private business premises; 1566 apartment blocks, and 67000 fenced households. There are over 70 private cultural institutions as well as 6 cinemas, 3 state-sponsored cultural centers, 8 libraries, 7 museums and 10 professional art and entertainment organizations. At present two electric power stations, 340 heating ovens and over 90.000 home ovens provide the city's electricity and heating requirements.